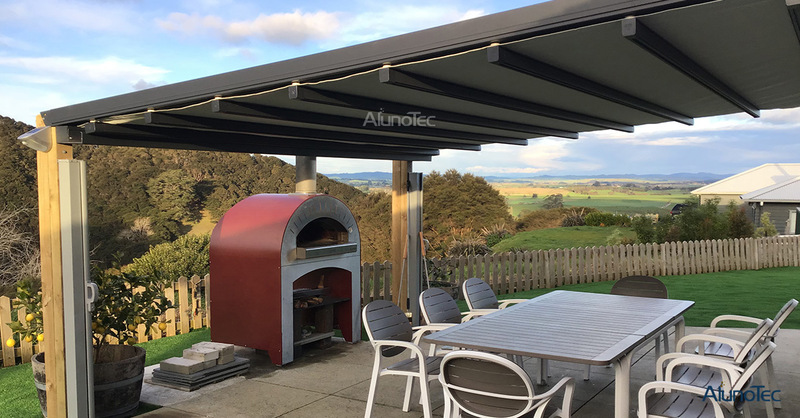 This is one of AlunoTec’s retractable awning project cases in New Zealand, for Mr. Edward’s house, as you can see, what a nice place it has been made! Aluminum retractable awning is popular for house garden application as it is sun-proof, light rain/wind resistance. This kind of motorized retractable awning has unique advantages to compare to other outdoor sun-shading products, as it can be opening and closed as will, durable, and can create big outdoor living space, can meet the needs to do many kinds of outdoor activities. This type of awning covers can have LED lights, people can enjoy another kind of surroundings if having a meal on evening. So if you want to own a good comfortable garden, AlunoTec’s retractable awning will make great help.